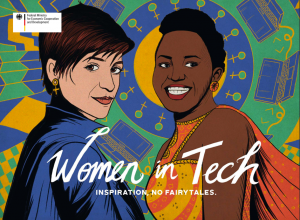 Why are women and girls still so seriously underrepresented in the tech world? Part of the reason is that 250 million more men than women currently click their way through the internet. It will remain a male-dominated sphere as long as not enough female content is developed, as long as technical innovations do not address the needs of women, as long as women remain the more frequent targets of digital violence, cyberbullying and hate speech, as long as codes and algorithms are written only by men, who sometimes automatically discriminate against women and female input ex ante, and as long as some societies forbid women from accessing a computer or enrolling in a computer science course. This is a dangerous state of affairs. We are all well aware that access to information translates into advantages and power. More education leads to better career options and allows a person to earn an income and ultimately lead a life of self-determination and greater freedom. Assuming that more and more business will take place online as we move into the future, and that women are structurally and disproportionately excluded from this development, then the divide between the opportunities available to men and to women, to boys and to girls, will widen with each passing year. In the Global South and North alike, there are still too few (well-known) role models for girls and young women who show that women can succeed in the tech industry. We all know the Bill Gates, Steve Jobs and Elon Musks of this world, but how many of us know the Martha Chumos and Dr Mmaki Jantijes? We need to hold up these shining examples of women succeeding in the digital world so young girls in both Nairobi and Frankfurt can see them clearly. After all, people tend to prefer the familiar path to the less travelled road. The role models in this collection have overcome huge challenges at times to establish their place in the tech industry. They can inspire young women and girls and encour-age them to explore possible career paths in tech. This book tells exciting stories of real women, not a fairytale princess among them. We would like to inspire girls everywhere to follow the examples set by these amazing women, these female inventors, scientists, web designers, managers and net activists.